It is worth noting that I am not using the Spring Framework anywhere in these first two blogs. Integration between Spring and GWT is a subject in itself and I want to try to keep each blog as focused as possible. In the third blog, I will show how to use Spring to publish and consume OSGi services and how this can be integrated with GWT. 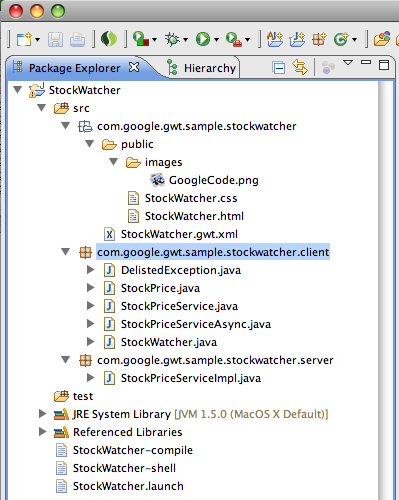 The blog will take a practical step-by-step approach to building the GWT StockWatcher sample described here. The Google tutorial takes you through the steps required to build a GWT sample from scratch using RPC. I will be referring to pages in the tutorial as we go through and discussing the advantages/disadvantages to various approaches. For the purposes of the paths used in the demo, I created a new Eclipse workspace at /Users/bcorrie/gwt/workspace. I have included zipped up projects you can download below, which contain a GWT_ROOT_INSTALL variable I have defined. To use my projects, when you import them navigate to “Preferences” -> “Java” -> “Build Path” -> “Classpath Variables” and define your own GWT_ROOT_INSTALL. The easiest way to create a GWT Eclipse project currently is to use the command-line tools provided with the GWT distribution: projectCreator and applicationCreator, with the -eclipse parameter as described here. These command-line tools create a simple Java project, skeleton project files, a Run Configuration to run your project in hosted mode and scripts for running or compiling the project outside of Eclipse. One limitation of these tools is that they are prescriptive about where your source code goes. Your source code must be in a project sub-directory called /src, your client code must be in a package ending in client and your server code in a package ending in server. The projectCreator and applicationCreator cannot be configured to do otherwise because this is typically where GWTShell and GWTCompiler expect your code to be. Later on, we’ll look at some ways of reorganizing the source code and tuning the Run Configurations to make them more flexible. Once you’ve created the project on the command-line, import it into STS. Use “Import” -> “General” -> “Existing Projects into Workspace”. Note that adding the /src folder to the classpath is a requirement of the GWTShell because it needs to have the metadata, such as its .xml file, on the Java classpath. Step 3: Run it in hosted mode - check that it works! Either click the “Run” button with the StockWatcher project selected, or choose the Run Configuration you created in Step 2. Note also that when you run in hosted mode, GWTShell creates a /www output folder into your project as well as a /tomcat folder to configure the embedded Tomcat. You’ll see these if you refresh your StockWatcher project after testing it. To create a WAR file, we need a Dynamic Web project… but we already have a Java project! So what’s the most sensible way to manage this requirement? Google recommend generating the compiled code into the Eclipse Java project and then cut-and-pasting the output from the GWT compiler and the generated .class files into a separate WAR project. My preference is to set up the GWT compiler to build the deployed code straight into the WAR project and to also split up the source code into the two projects so that the client code is in the Java project and the server code is in the WAR Project. Firstly, you don’t want your hosted mode to generate its /www and /tomcat folders into your WAR project. Thirdly, as discussed in Step 1, GWTShell and GWTCompiler mandate that your source code is in a sub-directory called /src. This limits your WAR project’s ease of integration with tools such as Maven and Ant. Finally, it allows the Java code to also be separated so that you’re not copying the redundant client code into the WAR file. While it may seem like unnecessary extra effort, you’ll see as we go forwards with the different approaches why breaking up the code early on makes it easier to deploy it as shared services later. So let’s create a new Dynamic Web project and at the same time, create a Server instance of the dm Server. If you don’t already have a dm Server instance in the workspace, you’ll need to hit the “New” button next to the “Target Runtime” textfield and select “Create a new local server”. Note that I’ve also chosen src/main/java and src/main/webapp for the “Java Source Directory” and “Content Directory” respectively. You can use the defaults, but these paths are recommended as they integrate well with build tools like Maven. Note that this division of code is not essential if you are just going to export your GWT code as a vanilla WAR file. 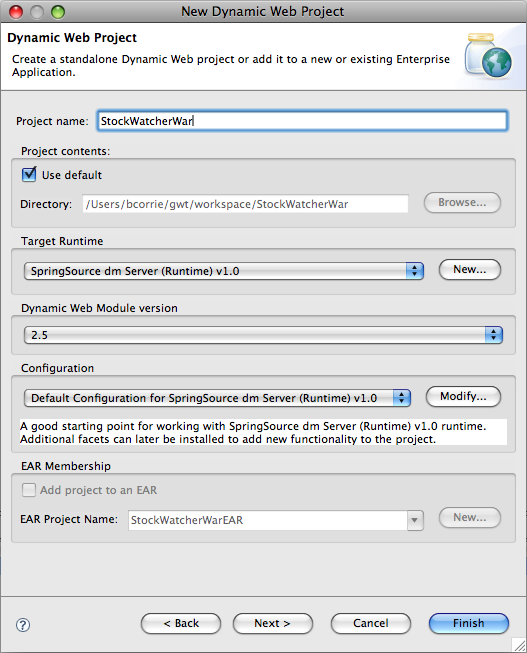 The simplest way to achieve that is to create your Java project as a Java EE Dependency of the WAR Project and Eclipse will turn your Java project into a JAR file which it adds to WEB-INF/lib in the WAR. However, the problems with that approach are that you package your redundant client code into the WAR and it makes it harder to split your application up into services later on. 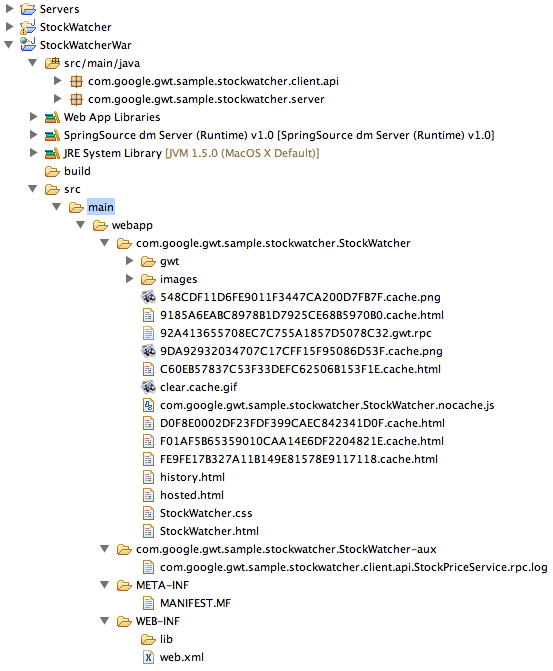 The last thing required in breaking up the code is to add the StockWatcherWar project to the build path of the StockWatcher project, so that it can access the classes in the com…client.api package (Properties -> Java Build Path -> Projects -> Add…). If you prefer, you can skip all of this arduous work by download a zip of my two finished projects, plus the various Run Configurations here (see Step 2 and Background for instructions on importing and setting up). If you have a clean workspace, you’ll need to create an instance of a dm Server runtime (New -> Server -> SpringSource …) and you may need to select the server runtime for the WAR project in “Properties” -> “Targeted Runtimes” as it may not match mine. Note that adding the source folders to the classpath is a requirement of the Google compiler. You’ll notice that the Google compiler generates the output into 2 folders reflecting the name of the GWT project. The compiler assumes that the target folder will be the same as the source folder and there is no way to disconfigure this, so you’ll have to drag the generated files into the src/main/webapp folder and then delete the 2 Google directories. This is in fact what Google themselves recommend you do here. Next, we need to add the required dependencies into our project. - Add web module dependency gwt-servlet.jar (“Properties” -> “Java EE Module Dependencies” -> “Add External Jar”). Note that this module depends on the javax.servlet APIs. - Modify the web.xml file as per Google’s instructions. It’s worth also adding StockWatcher.html to a <welcome-file-list> so that it comes up automatically on deployment (although this doesn’t always work when deploying in Eclipse as the browser window usually opens before the server is fully initialized). If you’re having problems, have a look at my zipped projects from Step 4. Now that we’ve created our shiny new WAR project, let’s deploy it to dm Server within STS. Simply right-click on the StockWatcherWar project and select “Run As” -> “Run On Server”. If the welcome page doesn’t come up automatically, either refresh the page or add /StockWatcher.html to the URL manually. Once you’ve got the WAR project running successfully, you can configure hosted mode to use dm Server as its server, rather than its embedded Tomcat. To do this, all you need to do is to modify the Run Configuration for GWTShell and change the Program Arguments to -noserver -out www http://localhost:8080/StockWatcherWar/. This allows you to quickly test client-side changes. Server-side changes are automatically re-deployed to the running server. Nice! It’s important to mention that if you want to run in the embedded Tomcat hosted mode with the setup I’m advocating, you need to temporarily unselect dm Server as the Targeted Runtime in the WAR project’s properties. 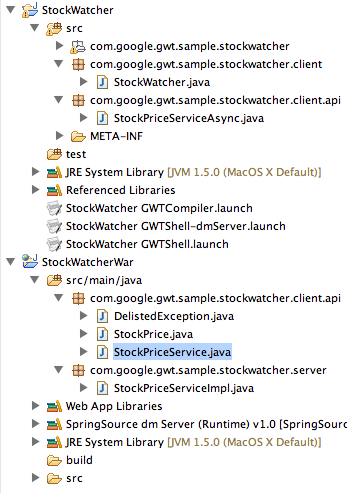 This is because adding StockWatcherWar to StockWatcher’s build path also pulls in dm Server runtime packages (such as javax.servlet) which messes up the build path of GWTShell. Assuming that this worked, let’s now package up our WAR and deploy it outside of the tooling. Firstly, we need to export our project as a WAR file. This is achieved with right-click on StockWatcherWar -> “Export” -> “Web” -> “WAR file”. 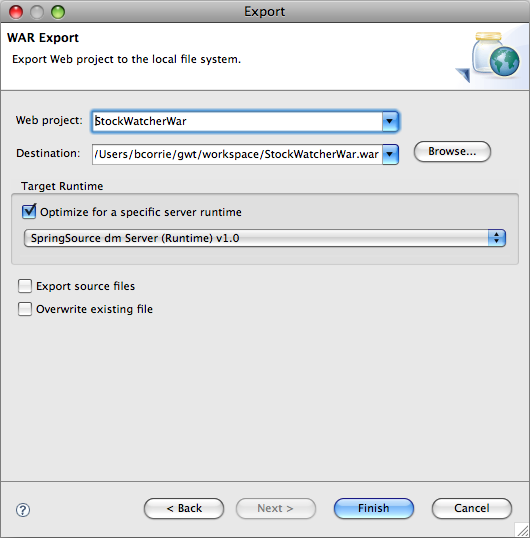 If you’re wondering where the “Overwrite existing file” checkbox is, it’s because there appears to be an Eclipse bug which hides it until you resize the WAR Export dialog. You can download my exported WAR here (note that it is zipped up). Once we’ve exported the WAR, we need to start up the dm Server outside of STS. [2008-10-27 14:14:44.468] server-dm-10 <SPPM0002I> Server open for business with profile ‘web’. The default username is admin and the password is springsource. For more detailed information on running and configuring dm Server, see the user guide. [2008-10-27 14:07:44.380] server-tomcat-thread-5 <SPSC1000I> Creating web application ‘/StockWatcherWar’. 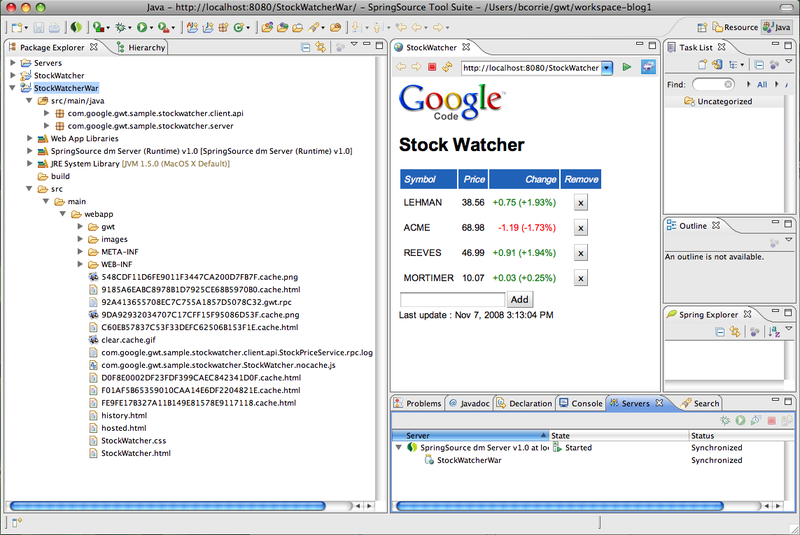 [2008-10-27 14:07:44.396] async-delivery-thread-1 <SPSC1001I> Starting web application ‘/StockWatcherWar’. 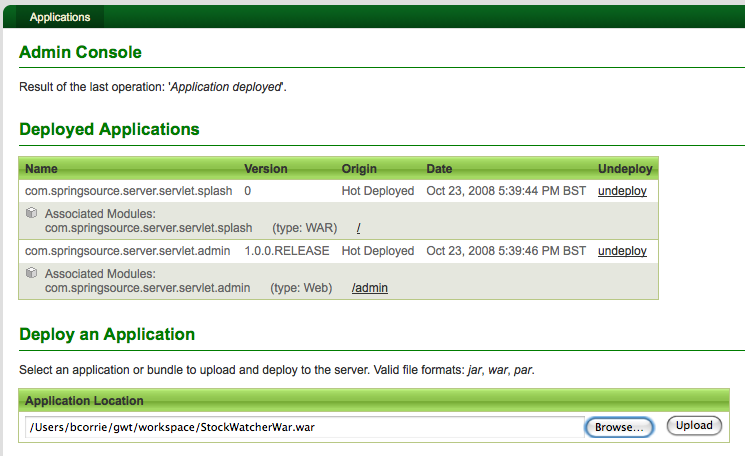 [2008-10-27 14:07:44.684] server-tomcat-thread-5 <SPDE0010I> Deployment of ‘StockWatcherWar.war’ version ‘0’ completed. Finally, all that remains to do is to click on the /StockWatcherWar link shown above and you are now using your GWT application! In the next blog, we will look at how we can make use of the OSGi capabilities of dm Server to extract our GWT dependencies out of the WAR and turn them into a bundle which can be shared by all GWT applications running in the server. We’ll also take a little peak under the covers to see our OSGi bundles interacting.